Set in 60 acres this lovely 8 bedroom family home is discovered up a long sweeping drive and has been fully restored to its former elegance. Tennis court, Games room with three-quarter size Snooker table. Stunning grounds with woodlands, garden, paddocks and menage. An elegant family home set in 60 acres and within just over an hour’s drive or train journey from London. Close to Haslemere or Liphook stations. 9 miles from Cowdray Park, 16.5 miles to Goodwood. An ideal place for family and friends to gather or to enjoy a sophisticated hen party with caterers! The main living area comprises of an elegant Drawing Room with wood burning stove, Sitting Room with open fire place, Dining Room with wood burning stove and a TV/snug room with wood burning stove. All with beautifully restored wood floors throughout. 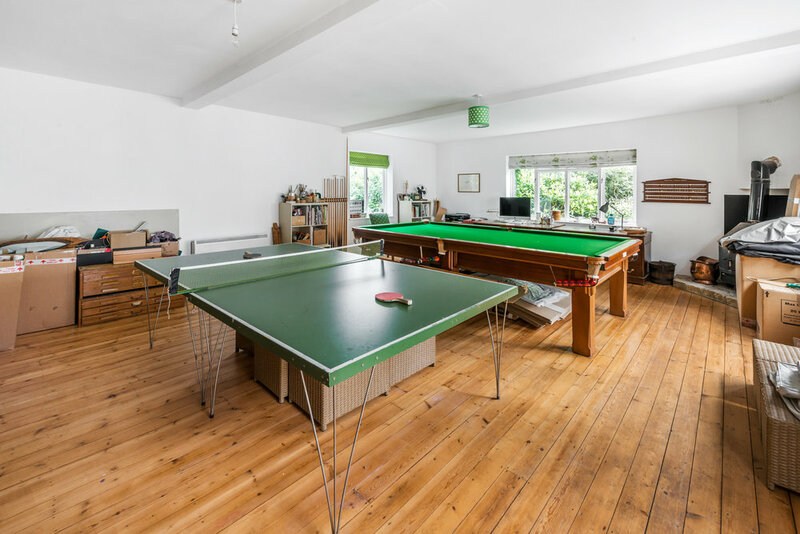 The Annex is a huge office/games room with a table tennis table and three-quarter-size snooker table. As you enter the house there is an impressive central staircase with a galleried landing from which you can access all five bedrooms on the first floor. There is a Master Ensuite with balcony, a huge Twin Bedroom (which can accommodate up to four single beds) with a Jack and Jill bathroom shared with a large Twin Bedroom (which can be made into a double). Two further large Double Bedrooms (one with a zip and link bed) share a bathroom on the back landing. On the second floor, in the eaves of the house, are two further twin bedrooms. Within the 60 acres of grounds are pretty gardens with a patio dining area with BBQ and seating areas, croquet lawn, tennis court and paddocks. Please note the house has Victorian stables attached and that these, the paddocks and outdoor school are in use.